Pace Wu attended the event to promote the Pro-Series shampoo, for which she is the face of the brand, in Nanjing, China on Saturday. Simone Rocha’s feminine silhouettes and statement textures took centre stage during the designer’s Fall 2013 runway show, and Pace’s crinoline dress perfectly encapsulates both. Designed with an attached slip, her sleeveless ivory frock with a structured double-layered skirt features floral embroidery throughout. Pretty pink lips matched her Gianvito Rossi silver toecap pink pumps, and the glossiest tresses I have ever seen completed her look. She really is the perfect brand ambassador. 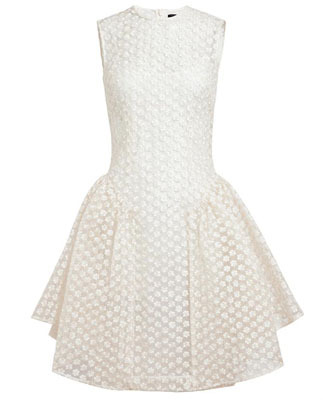 You can buy Pace Wu’s Simone Rocha dress from Browns Fashion and Saks.com.